How Can Paid Traffic Help You Get the Most from Your IM Business? Everyone likes to get things for free. And using some of the best free traffic generation methods can help you drive a lot of traffic to your site. If you start accounting for your time and effort, you’ll quickly find that free sometimes isn’t free. That’s where some paid techniques come in and make a lot of sense for many webmasters. Paid traffic has its own unique benefits, allowing you to use flexible campaigns, target a huge number of keywords or benefit from inexpensive start-up costs. Website traffic statistics also show that people who click on PPC ads are often far more likely to end up buying. They are also more likely to sign up for something than those who reach you through regular, free search engine listings. Paid vs. Free Traffic Acquisition – What’s the Real Difference? 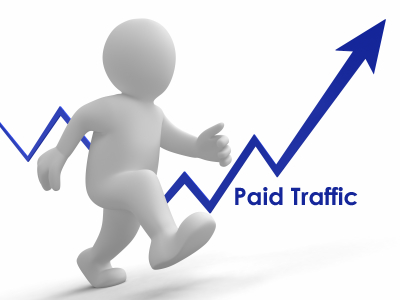 One of the main differences between paid and free traffic generation is that you get faster, more targeted results. All while receiving new visitors from day one. You also receive new visitors from day one. This is all without having to worry about the tedious, slow activities involved with most SEO techniques. Also, apart from the fact that you get near instant traffic, you won’t have to worry about hurting your page rank. This includes getting search engine penalization in any way. Both of the major paid models – PPC (pay per click) and CPM (cost per impression) – are entirely independent of your SEO campaign. This leads us to another important advantage that paid traffic campaigns have over free ones: you can use both of them without having them interfere with each other. There is no reason why you should abandon your resourceful SEO services, techniques, and tools just because you have added paid advertising to the equation. Finally, as opposed to free marketing campaigns used to drive traffic to your website, where you’re at the mercy of a search engine in terms of where (more like on which hundredth page) your site’s listing will appear at least in the first few months, with paid services you have nothing to worry about, as your listing will be placed strategically on the page in order to attract the attention of internet users. • Instead of using your own online marketing skills in order to target more customers, with the help of PPC and CPM experts, your business will be marketed in the right place. You can be certain that your ads will be viewed by people who are truly interested in what you have to provide. • When you buy web-site traffic, you get a virtually unlimited number of keywords to work with, and with a sound promotional tactic, your potential of obtaining highly targeted results is endless. You can’t even hope to get close to such benefits while trying to optimize your website the old fashioned way and losing the benefits offered by untapped keywords and key phrases. • Timely product sales can easily be achieved with paid search campaigns which present a high rate of flexibility, allowing you to customize your experience entirely. This can be done by making various changes to your strategy and testing it for organic search optimization while achieving test results the same day you started exploring the many available variables. Many businesses have started paying for targeted traffic, and they have achieved far better results with it than by using free campaigns. While an investment is involved, most services allow for flexible payment plans. Also, apart from getting better search results, you gain the benefit of investing less time and effort into your marketing campaigns. This is a great asset for any business owner as time is always in short supply. Managing a company is never easy, and by freeing some of your time, you can engage in other activities like enhancing your customer support services. Nevertheless, paid searches are not for everyone. If you’re selling low price products or you can’t attach a specific value to your website traffic rank. Your profit may be cut short by the high ad costs. Some of the services providing PPC campaign management will offer you a limited free trial. So you can try out the service before spending any money, and see if it really works for you.